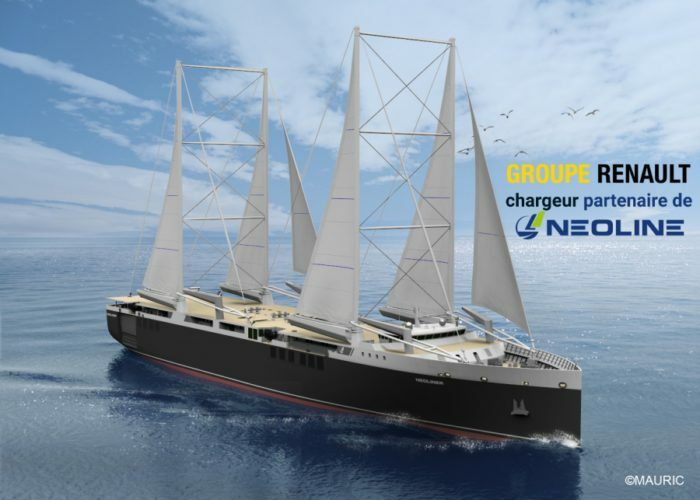 Car manufacturer, Groupe Renault, is partnering with French designer and operator of cargo sailing ships, NEOLINE, to reduce the carbon footprint of the Group’s supply chain. Renault Group is on a mission to cut is carbon footprint 6% by 2022. 60% of the parts in Renault’s supply chain travel by sea at some point and many of its finished automobiles are transported by ships as well. It is partnering with Neoline to build two experimental roll-on/roll-off car carriers powered by sails. Each will be 446 feet long and carry more than 45,000 square feet of sails. Both will be capable of hauling 478 cars and they are expected to average 11 knots when at sea. It is anticipated the new age sailing ships will slash emissions by 90% compared to conventional freighters. They will also have hybrid diesel electric propulsion for operations in port and to ensure on time deliveries. They are expected to enter commercial service before the end of 2020. The design incorporates the latest marine technologies and lessons learned from competitive offshore sailing. NEOLINE has designed a 136-meter ro-ro with 4,200 square meters of sail area it says has the potential to reduce CO2 emissions by up to 90 percent through the use of wind power primarily, combined with a cost-cutting speed and optimized energy mix. commission the vessels by 2020-2021 on a pilot route joining Saint-Nazaire in France, the U.S. Eastern seaboard and Saint-Pierre and Miquelon (off the coast of Newfoundland in Canada).